The New Testament begins with the genealogy of the Lord Jesus Christ, verses 1-11 cover the period from Abraham the patriarch of the Israelites to their Babylonian Captivity, the vocabulary consists of 49 words which is the product of 7 x 7 = 49, note that the 49 notes on the Musical Scale Chart are arranged into 7 rows of seven notes and the seven candlesticks in Revelation hold seven lamps or candles = 49 candles. The number 7 in the Biblical meaning of numbers symbolizes spiritual perfection. I have not included all the examples supplied by Ivan Panin concerning the phenomena of sevens in the first 49 words of the New Testament and following is what Ivan Panin said about his demonstration of the subject. This enumeration of the numeric phenomena of these 11 verses does not begin to be exhaustive, but enough has been shown to make it clear that this part of the genealogy is constructed on an elaborate design of sevens. Let us now turn to the genealogy as a whole. I will not weary your readers with recounting all the numeric phenomena thereof: pages alone would exhaust them. I will point out only one feature: The New Testament is written in Greek. The Greeks had no separate symbols for expressing numbers, corresponding to our Arabic figures, but used instead the letters of their alphabet: just as the Hebrews, in whose language the Old Testament was written, made use for the same purpose. Accordingly the 24 Greek letters stand for the numbers: 1, 2, 3, 4, 5, 7, 8, 9, 10, 20, 30, 40, 50, 60, 70, 80, 90, 100, 200, 300, 400, 500, 600, 700, 800. Every Greek word is thus a sum in arithmetic obtained by adding the numbers for which its letters stand, or their numeric values. Now the vocabulary to the entire genealogy has 72 words. 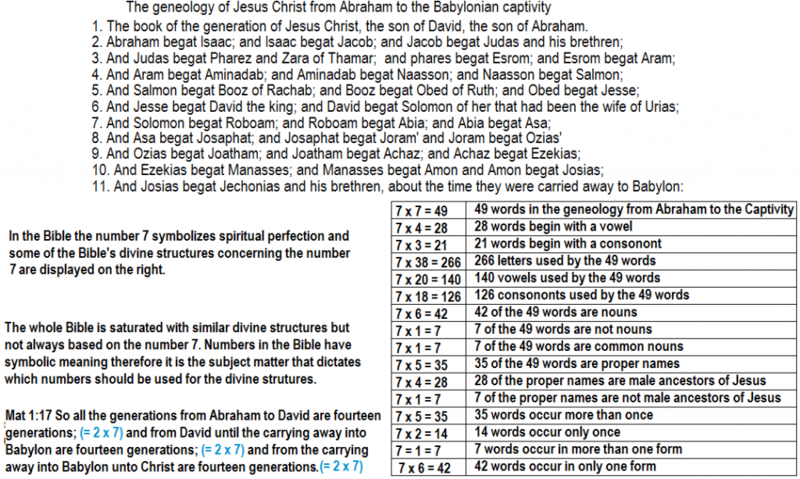 The entire genealogy of Jesus contains 72 words which have a gematria of 42,364 (7 x 6,052 = 42,364). The second part of the chapter verses 18-25 commences after the genealogy and deals with the childhood of Jesus. Ivan Panin states concerning the second chapter of Mathew. This chapter has at least four logical divisions, and each division shows alone the same phenomena found in the chapter as a whole. Thus the first six verses have a vocabulary of 56 words, or 8 sevens, etc. There are some speeches here: Herod speaks, the Magi speak, the angel speaks. But so pronounced are the numeric phenomena here, that though there are as it were numerous rings within rings, and wheels within wheels, each is perfect within itself, though forming all the while only part of the rest. There is not, however, a single paragraph of the scores in Mathew that is not constructed in exactly the same manner. Only with each additional paragraph the difficulty of constructing it increases not in arithmetical but in geometric progression. For he contrives to write numeric relations to what goes before and after. Thus in his last chapter he contrives to use just 7 words not used by him before……thus we have a miracle – an unheard-of literary, mathematical artist, unequalled, hardly even conceivable. A second fact is yet more important : In this very first section, the genealogy discussed above, the words found nowhere else in the New Testament, occur 42 times, 7 x 6 and have 126 letters 7x6x3, each number a multiple of not only of seven, but of 6 sevens, to name only two of the many numeric features of these words. But how did Mathew know, when designing this scheme for these words (whose sole characteristic is that they are found nowhere else in the New Testament) that they would not be found in the other 26 books-that they would not be used by the other New Testament writers? Unless we assume the impossible hypothesis that he had an agreement with them to that effect , he must have had the rest of the New Testament before him when he wrote his book. The Gospel of Mathew, then, was written last. Ivan Panin demonstrated that every part of the whole Bible contains similar designed numeric phenomena even though the work is so vast it will probably never be completed, enough has been revealed to demonstrate that the numeric designs greatly exceed man’s ability to construct. Though different people over a period of 1400 years wrote the original texts of the Bible they could not have been the source of the words which were somehow dictated to them with or without their knowledge. There are other divine designs pervading the entire Bible that exceed man’s ability to construct and demonstrate the divine origin of the Bible. We should mention that the Bible accurately foretold important historical events centuries or thousands of years before they happened which is the most obvious supernatural content of the Bible. The words of the Bible were recorded over a period of 1400 years forming intricate designs that the authors probably did not know existed, demonstrating that the words of the Bible were preordained by a higher intelligence that controlled every detail of the whole production.